Using a device that can turn a tiny piece of laboratory space into an ion cloud as hot as those found in a nuclear fusion reactor, physicists at the National Institute of Standards and Technology are helping to develop one of the most exotic “yardsticks” on earth, an instrument to monitor conditions in the plasma of an experimental fusion reactor. Their measurement tool also is used in incandescent light bulbs–it’s the element tungsten. The intended beneficiary of this research is ITER, a multinational project to build the world’s most advanced fusion test reactor. ITER, now under construction in Cadarache, France, will operate at high power in near-steady-state conditions, incorporate essential fusion energy technologies and demonstrate safe operation of a fusion power system. 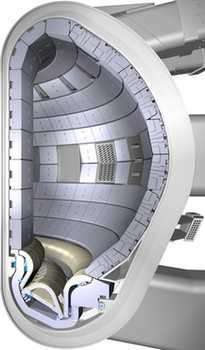 It will be a tokamak machine, in which a hot—250 million degrees Celsius—plasma of hydrogen isotope ions, magnetically confined in a huge toroidal shape, will fuse to form helium nuclei and generate considerable amounts of energy, much the same way energy is generated in the sun. One major issue is how to measure accurately the temperature and density of the plasma, both of which must reach critical values to maintain the fusion process. Any conventional instrument would be incinerated almost instantly. The usual solution would be to use spectroscopy: monitor the amount and wavelengths of light emitted by the process to deduce the state of the plasma. But light comes from electrons as they change their energies, and at tokamak temperatures the hydrogen and helium nuclei are completely ionized—no electrons left. The answer is to look at a heavier element, one not completely ionized at 250 million degrees, and the handy one is tungsten. The metal with the highest melting point, tungsten is used for critical structures in the walls of the tokamak torus, so some tungsten atoms always are present in the plasma. To gather accurate data on the spectrum of highly ionized tungsten, as it would be in the tokamak, NIST physicists use an electron beam ion trap (EBIT), a laboratory instrument which uses a tightly focused electron beam to create, trap and probe highly charged ions. An ion sample in the EBIT is tiny—a glowing thread about the width of a human hair and two to three centimeters long—but within that area the EBIT can produce particle collisions with similar energies to those that occur in a fusion plasma or a star. In a pair of papers, the NIST researchers uncovered previously unrecognized features of the tungsten spectrum, effects only seen at the extreme temperatures that produce highly charged ions. The NIST team has reported several previously unknown spectral lines for tungsten atoms with 39 to 47 of their 74 electrons removed. One particularly significant discovery was that an anomalously strong spectral line that appears at about the energies of an ITER tokamak is in fact a superposition of two different lines that result from electron interactions that, under more conventional plasma conditions, are too insignificant to show up. Team member John Gillaspy observes, “That’s part of the fascination of these highly charged ions. Things become very strange and bizarre. Things that are normally weak become amplified, and some of the rules of thumb and scaling laws that you learned in graduate school break down when you get into this regime.” The team has proposed a possible new fusion plasma diagnostic based on their measurements of the superimposed lines and supporting theoretical and computational analyses. Yu. Ralchenko, J. Reader, J.M. Pomeroy, J.N. Tan and J.D. Gillaspy. Spectra of W(39+)-W(47+) in the 12-20 nm region observed with an EBIT light source. J. Phys. B: At. Mol. Opt.Phys. 40 (2007) 3861-3875.